This card frame packaging system fits up to ten 5.25" x 1.5" x 7" modules into a standard 3U rack space. Mounting rails, end pieces and rack ears easily bolt together to form a sturdy cage. FracRak Case includes hardware, 7" deep end pieces, mounting rails, black coated rack ears with a light textured finish, and the top, bottom and rear panels for the FracRak. 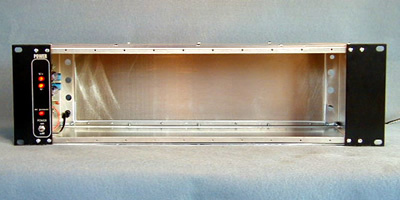 Shown with FR-PWP power wing panel option for mounting a 9770 series power supply. Check out the single, double and triple wide black anodized blank panels. And don't forget the FR-PWP Power Wing and Power Supply options.